The Marvel Cinematic Universe is entering into untested grounds. While the first phase of films was groundbreaking in its structure, it still had the familiar grasp of forward momentum. Like a wave crashing onto the beach, the momentum is beginning to recede as Marvel gears up for their next big push. So it falls on the capable shoulders of Robert Downey Jr.’s Iron Man to embrace the narrowing focus of the universe, while still setting in motion the momentum for the next phase of Marvel films. So considering the pressure this film is under, it makes sense that we are seeing an expanded presence from this film’s marketing as the Super Bowl approaches. We do not have the new TV spot, or a full trailer just yet, but Marvel Studios has just released a beautiful new poster to stroke everyone’s anticipation glands. 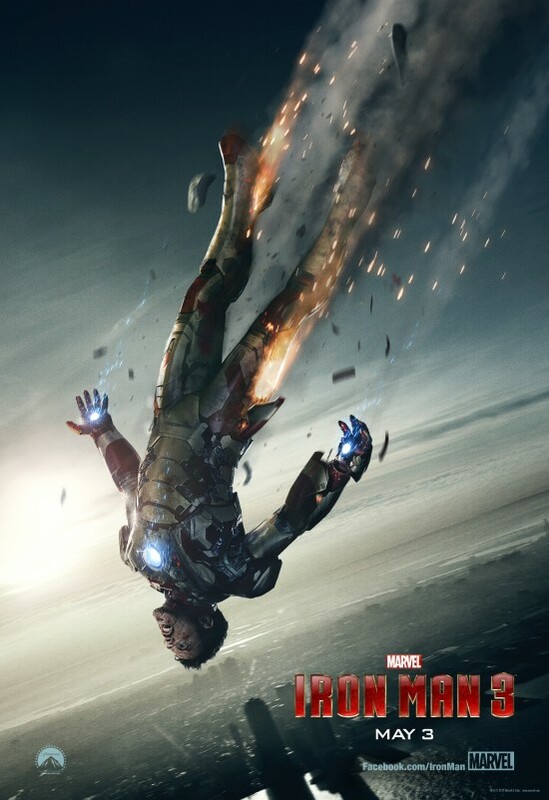 The poster itself is a simple image of Iron Man, or as simple of an image of Iron Man you can get when he is plummeting to his certain doom. A cheery one-sheet that sets the tone for the ringer Tony Stark is set to be sent through. You can check out the full new poster after the jump. Iron Man 3 is expected to go into some darker places, but still maintain the tone and spirit fans expect from the Marvel hero. Which is an interesting contrast to DC’s big summer comic book film which looks to take their iconic character to some serious places, while distancing the character from the tone and spirit of his roots. Of course in any event, Iron Man 3 is going to be one of the event films of the year. The world wants to know what is in store for the Marvel Cinematic Universe after the very public (and very profitable) debut of The Avengers. Double standards? I think so. Is Ironman supposed to be a “dark” character? This poster just screams dark and gritty to me. Incredible! This blog looks just like my previous one! It is on a entirely different topic but it’s pretty a lot the same layout and design. Great choice of colours! Good web site! I truly love how it is simple on my eyes and the data are well written. I am wondering how I might be notified when a new post has been made. I’ve subscribed to your feed which must do the trick! Have an excellent day!